We have mounted our RescueMe inside our inflatable PFD - so its there if we need it and is sure to float as well as you do. Its so small, you can pack and be sure you have it when you need it! For divers, take a look at the all new PLB Dive Canister to protect your PLB while you dive. 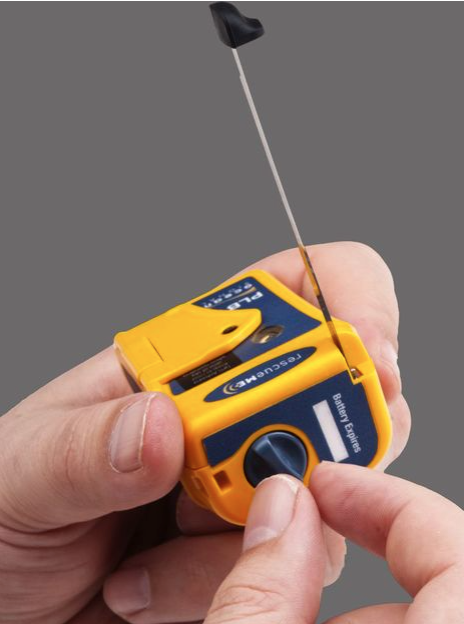 The RescueMe is approximately 30% smaller than the current range of PLBs, and with a 7 year battery life, the rescueME sets the new standard for marine and outdoor PLBs. Personal Locator Beacons are global devices, and regardless of where yours is 'coded and registered', works the same way. In some countries and territories, the RescueMe retails at higher prices than we have here in Australia. If you purchase one from us, then it will be coded for registration with AMSA (register here). If your primary residential address is not in Australia, then AMSA will contact you and suggest that you have the PLB recoded for your country of residence. This is not required, just preferred by the Australian authorities. Includes unique mounting clip, set of straps for fitting to various locations and flotation pouch. Find out more about Adventure Safety . hopefully we will never have to use it,but its reassuring that we now have a state of the art PLB. Obviously it's tiny...but heavy for it's tiny size. $365 overall cost spread over a 7 year battery life = $52 bucks a year. Cheap life insurance for 'off track' bushwalking in remote areas....thumbs up from me. Let's hope I never have to use the thing, and I obviously can't review the functionality but this thing is super light and tiny. Comes with a clip and a floaty pouch. Test went perfectly and seems really easy to use. Advertised as easy to open with one hand and you can although I doubt it'd be 'easy' if you were in adverse conditions.